Still, there is always something to photograph and in a brief interlude between downpours we set off to Cascades to photograph the waterfalls. The interlude didn't really last so we found ourselves photographing in the rain once there. This is a skill I have yet to learn admittedly. I've watched some British photographers work with admirable aplomb in the pouring rain, seemingly able to get clean streak free glass as they work slowly and methodically placing and removing filters, adjusting composition and so on, while their body takes on the resemblance of a thoroughly drowned rat. In my attempts I just end up with a sodden camera and a film of water on the lens that becomes impossible to remove. 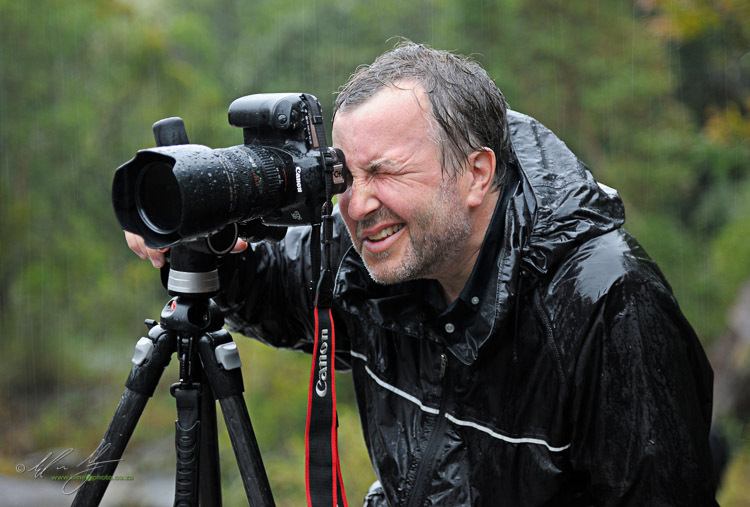 Clearly I am doing something wrong (I don't think 'making photographs in the rain' is the right answer to that). The following morning any thought of a sunrise shoot was swept away in the downpour. We did manage to get a few shots off though as the mountain suddenly emerged, wreathed in tendrils of mist and low lying damp cloud (first image in this post). Regrettably I was laid low by a stomach bug so ended up teaching in the lodge rather than attempting the 14km walk to the tunnel and back. Nonetheless it was a productive day for the photographers who opted to avoid getting soaked and concentrate on post-production techniques. First dry light of the entire workshop. 2 stop hard ND grad metered of the grass in the middle distance. Sunday dawned cold and clear and we finally got some time with the mountain sans rain and cold. The flanks of the Amphitheatre burned a throbbing red as the sun finally gave us some warmth. 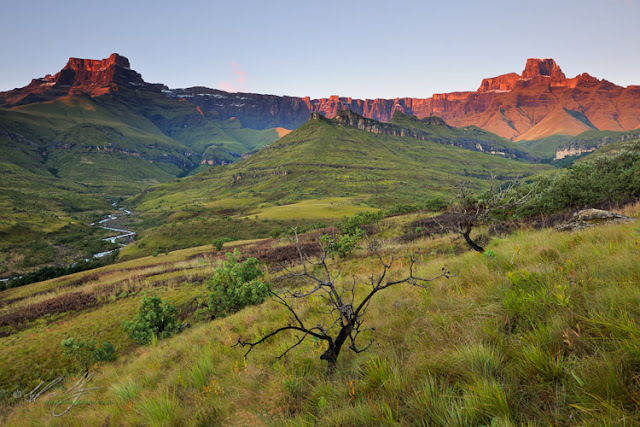 From there it was a dash to the Cathedral Peak portion of the Drakensberg to set out on the primeval like Rainbow Gorge. A waterfall at the mouth of the tunnel at the end of Rainbow Gorge. A polarizer helps control reflections. The exposure was optimized for shadows and to just avoid clippping the highlights. In post the darks have been darkened. Inside the gorge, the rivers swollen with the prodigious rain and continuing rain on the escarpment, sometimes made conversation difficult as our voices were drowned out by the roaring water. The raised water levels also meant that only a few (foolhardy?) could actually made it the whole way to the hanging boulder at the end of the gorge. Even without reaching the end everyone was thoroughly drenched as water sheeted down from the sides of the gorge from time to time (and of course there were the somewhat hairy river crossings). There's not much of a teaching point in this post apart from to make sure that you carry enough drugs with on photographic trips. My veritable pharmacy of photographers meant that despite being laid low with a stomach bug I was able to remain relatively active (to the point that I was only stationary for one day). Travel with the right meds and you will increase your shooting time. Just don't be ridiculous and get caught up in hypochondria as you prepare I suppose. To my pill-pushing saviours though, Thank You! One more take away is this: even with rain one can create interesting images. 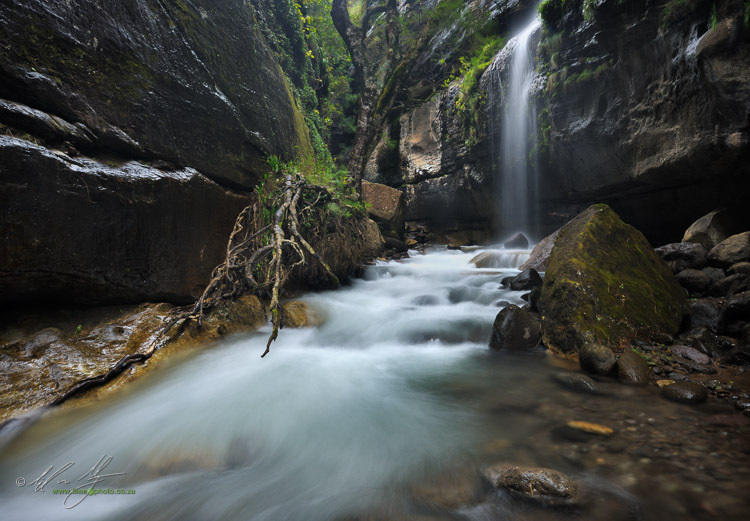 As long as you are careful, your camera is able to withstand a fair dose of the elements. Keep a towel handy and make sure that the gear doesn't stay wet for too long and dries out slowly (not near a fire or heater - this just causes condensation) and you can keep shooting in the rain.